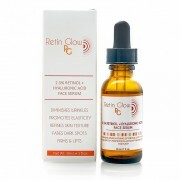 Retin Glow’s Green Peeling Serum is a combination of 7 AHAs and BHA (alpha hydroxy acids and beta hydroxy acid) plus Vitamin C.
The inclusion of a range of acids allows the peel to be more potent with the ability to offer multiple benefits to the skin. The peel is frequently used to treat acne, deep wrinkles, fade discoloration and smooth rough skin texture. It is ideal for use on the face or all over the body. There is no other chemical peel that is formulated with this perfect cocktail of high performance acids. TCA (Trichloroacetic Acid) is a powerful exfoliating solution that will peel away the top layers of the skin to reveal a brighter, smoother, more youthful complexion. TCA is stronger than lactic, salicylic and glycolic acid. It softens rough skin and removes dark spots, acne, wrinkles, fine lines, and unsightly marks. Glycolic Acid is the most popular AHA because it is the most versatile skin care ingredient that offers numerous skin benefits to the skin. Glycolic Acid penetrates the epidermal & dermal layers of the skin, minimizes appearance of pores, and removes dead skin cells from the surface of the skin. It has an exceptional advantage due to its small molecular structure which gives it the greatest penetration ability to stimulate the growth of new skin cells and collagen. Salicylic Acid is ideal for erasing and preventing acne. It penetrates the skin to remove the dirt, dead skin cells, and sebum that have clogged the pores. As the salicylic destroys the debris, you will find that acne is eliminated, and its chance of recurrence significantly reduced. Citric acid is an AHA (alpha hydroxy acid) that comes from citrus fruits. It offers powerful antioxidant protection and protects the skin from harmful environmental stressors such as polluted air, sun damage and other free radicals. Citric Acid also encourages collagen production to firm sagging skin and diminish wrinkles. Malic Acid is an AHA (alpha hydroxy acid) derived from apples. Malic acid exfoliates the skin so it becomes soft and supple. It also decreases the signs of aging by softening wrinkles. Mandelic acid is an AHA (alpha hydroxy acid) that is made from bitter almonds. It is generally less irritating than other peels, so it’s a great choice for beginners. Mandelic Acid also has powerful anti-bacterial properties which makes it perfect for treating acne. Vitamin C protects the skin from stressors such as excess exposure to the sun and environmental pollution. It helps to promote a brighter skin tone, and makes the skin softer, smoother and more luminous. It offers so many benefits to the skin that all skin care regiment, at any age, should include a Vitamin C product. The After-Peel Neutralizer is needed to stop the action of the chemical peel. It deactivates the acid and prevents the peel from penetrating further into the skin. It also helps to restore skin to a normal pH level. The Neutralizer contains soothing botanicals such as, Aloe Vera, Green Tea and Chamomile. These ingredients will calm the skin and promote healing. The silky texture makes it easy to apply and it is more soothing and less messy than gritty baking soda. If you are susceptible to cold sores, chemical peels may increase the chance of an outbreak.